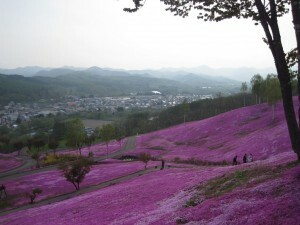 On my latest trip to Japan we had the wonderful opportunity to go to Hokaido (北海道). I have been to Japan around 14 times, and this was the first time I had been to Hokaido. I wish I had come sooner, what a great place. Our Aikido group was going up to this location for a few reasons. First, to visit and get a sence of Osensei’s live and get a glimpse into the area and history that is part of our Aikido heritage. 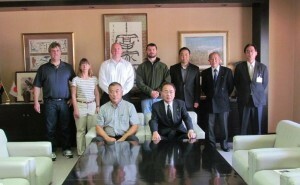 Second, to visit some of the Aikido instructors, dojos, and expand our Aikido friends in the world. Lastly, to have a good time, good food, and get a little rest and relaxation in this beautiful area. In my last post we talked about our Aikido experiences in this area so will not go much into that in this post. We started our trek from the Haneda (羽田空港) Airport in Tokyo. This was the first time I have flown from this airport so did not know what to expect. It is very easy to get to Haneda and did not take a long time. From Shinjuku we took the JR Yamanote line (山手線) to Hamamatsucho(浜松町). Here we transfered to the Tokyo Monorail (東京モノレール), and was a straight shot from there (20 min and approx 500 yen). To me this airport had a very laid back view and strangely felt relaxing. As this was not an international flight the security was lighter than the US. For example, we did not have to take off our shoes in the screening line, and we could bring liquids through (which was interesting as the security agent asked me to open my water bottle then took a good whiff of the water, not sure safe, but..). We then go on our local flight to Monbetsu Ohotsuku (オホーツク紋別空港) airport. Quick flight and not many people on the flight. The stewardess was very curious why so many foreigners were going to Monbetsu and asked Izawa sensei a few questions. I guess they don’t get a lot of foreigners on that flight. We landed and got our bags. 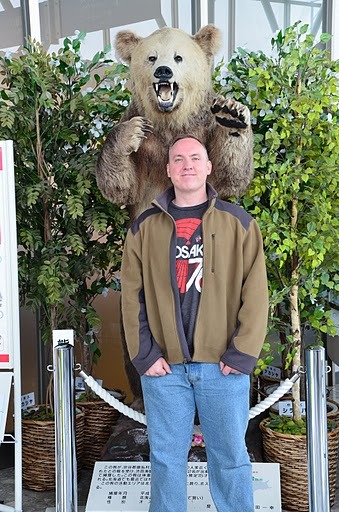 In the lobby of the Monbetsu airport there was a huge stuffed bear which we all took a picture with (Russians and Bears). We were picked up by Ozaki sensei and took a trip into town. 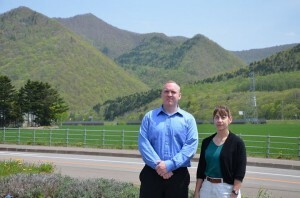 We took a nice drive up to the Monbetsu observatory (and local ski run) and got a nice veiw of the overall landscape. It was pretty nice to have mountainous terain on one side and the ocean horizon on the other. Probably an optical illusion, but the ocean’s horizon seemed to have a slight bend to it. We then drove into Monbetsu to have lunch (seafood) where we picked a few items from the freezer and they cooked for us on the spot. Apparently Monbetsu is know for its drift ice. As it was summer of course it was a beautiful day, but we saw the ice breaking ship, and got a glimpse of the ice flow museum. Sounds like the ice is pretty cool to see and hear. 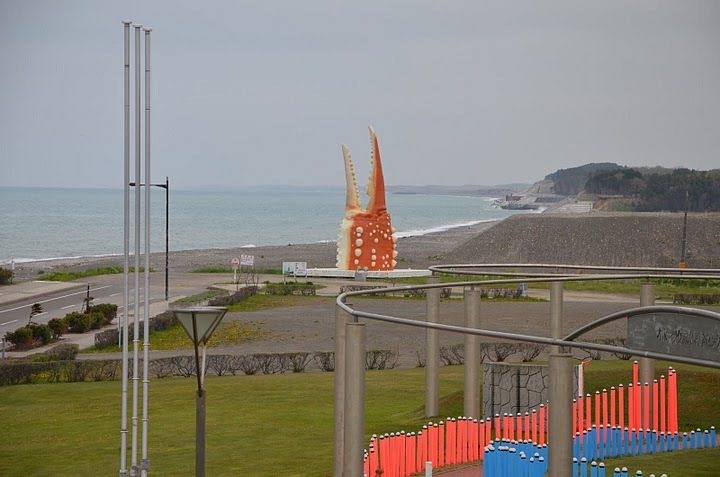 We then went to Yubetsu (湧別町) to get settled in and get ready for practice. After practice and before dinner we went to the local Yubetsu onsen (hot bath). These things are great. They have all the normal shower facilities (you need to shower and soap up before going into the Japanese onsen by the way!) and have a number of baths. There are two sides (one for men one for women) and each have a little different flavor of the garden outside and the baths themselves (which switch sides from men/women almost daily). Mostly they had two baths inside at different hot temperatures, and one hot bath outside in the garden area. Also outside they had a cold bath (12C) which was FREEZING. I got in and went under once and my brain frooze (no really it did!). After bath they have a relax area outside the baths and a restaurant too. A great deal for 500 yen (for the basic onsen). The next day we were asked by the local Yubetsu mayor Mr. Masami Harada to have a small visit at the city office. 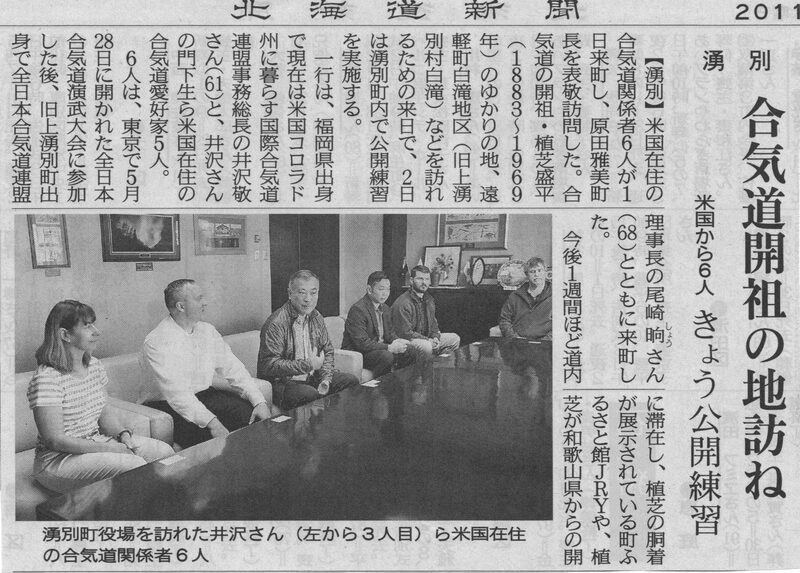 We showed up and there was also a reported from the Hokaido Shimbun/newspaper). We sat down and started with introductions. If you travel to Japan and may be meeting various people it is good to have a business card even if just your name and email address. It is proper to receive the persons business card with two hands if possible, and take a look to read over its contents (right as you are receiving it). Then you can give yours and give your name and that it is nice to meet them. Do not put the card right into your pocket as can be considered rude. One way I have learned is that if you get a few cards of all the people you are meeting and put them out in the table in front of you in the relative positions where the persons are sitting. Then you can reinforce their names, and shows that you are making an effort. You can also put it away in a card case, etc). 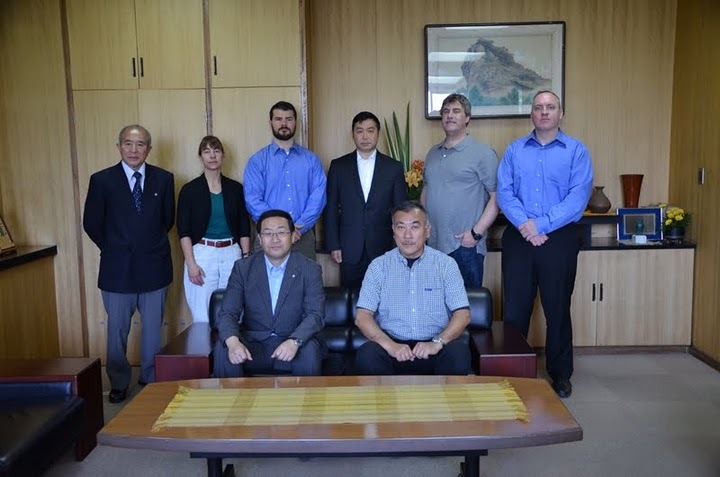 After introductions the Mayor and Izawa sensei continued to talk a little about the area and also about why our group made the trip out to their area. As the newpaper reporter was there it made me think a little deeper about what was going on and how our group fit in. As most everyone knows the terrible earthquake/tsunami that hit eastern Japan is a very large concern to all in Japan and affecting all regions. The mayor (and I think the people in the area also) have seen a big drop off on tourism and visitors to the area from people from all countries. We talked a little bit about there is a lot of mis-information in the press and concern for safety and the reluctance for people to come over from Japan. They wanted to know what some of the views of Japan are in America and also why the group decided to continue our trip in light of the concern for Radiation, etc. doing my part in trying to help spread the enjoyment and excitement of Japan and its many beautiful and interesting sites! What can you do? * Rights to Hokaido Shimbun, From June 2, 2011. 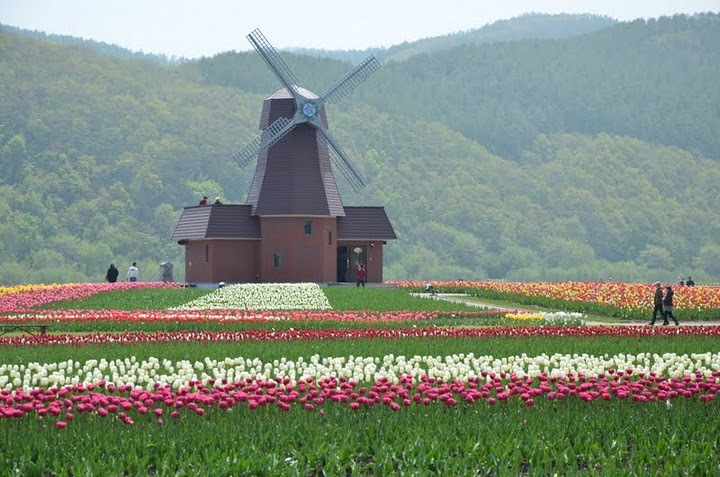 After our meeting with the Yubetsu mayor we went to one of the main attractions of the city which is the Yubetsu Tulip Park. 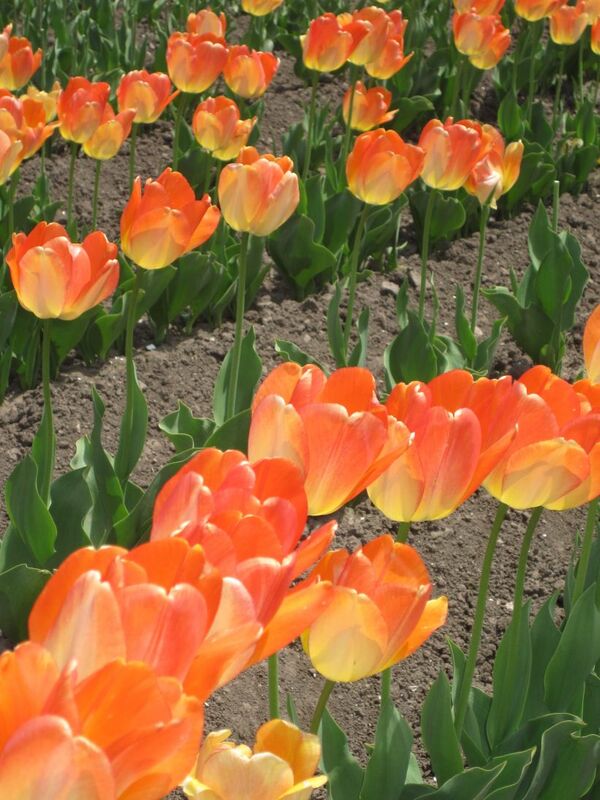 This is a pretty big park that has over 120 tulip varieties and more that 120,00 tulips in total. All differnt types, shapes, colors, sizes, etc. Pretty impressive even though I am not a “flower” person. We took a small tram around the park, and then we took a nice walk around and enjoyed the scenery. 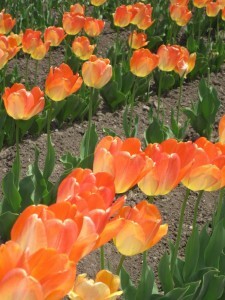 I think this area is famous for Tuilips and almost every house, park, and building have a small tulip garden. Right next to the this area was the Yubetsu Town Museum JRY . This was a pretty cool new looking building and a nice stop after the tulips. Here they have a lot of exibits and history on the area and its people. One of the main points of this was the introduction of the farmer soldiers. 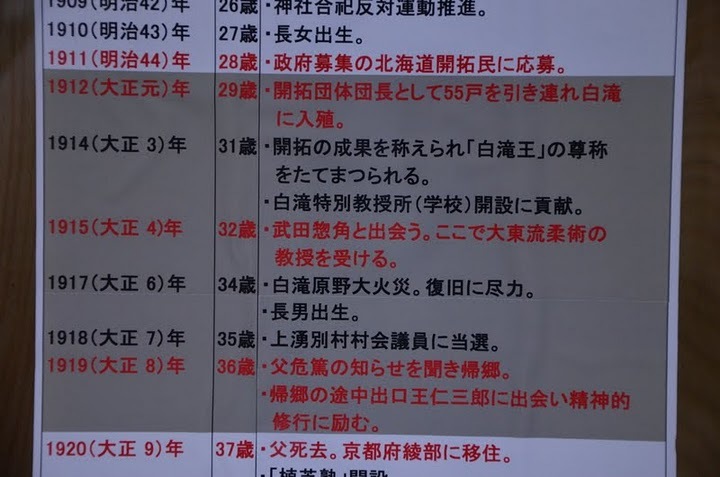 As this was very far away from the main areas of Japan the government assigned these farmer soldiers to the area (and others) to help protect and police the area. I believe these basically turned into the local police in the area in modern times. It was pretty harsh conditions and the people were tough to stick it out. 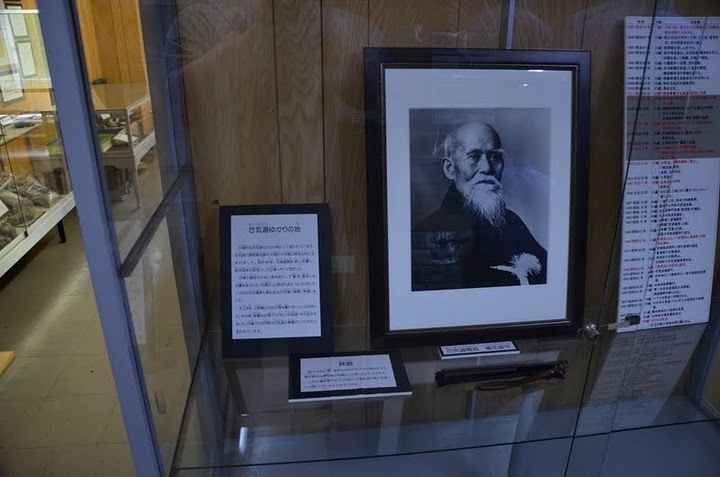 The museum had a small area devoted to Osensei (it had one of Osensei’ Keiko Gi), and a little on his history in the area. What a good view into the lives of people in that time. I think gives us a good view into this time in Osensei’s life and hardships (I could be wrong on exact number, but I think I heard Osensei chopped like 300+ plus trees in one year by himself). 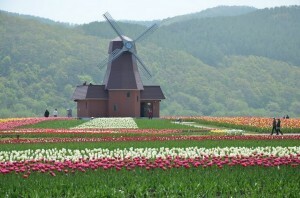 After the Yubetsu Tulip Town Park we went to the Takinoue Park. When going around this area there were large patches of these tiny pink flowers. This special area the people who run the area “encouraged” this in a large scale and a large portion of this hill side was covered in pink (not much green). It was a pretty cool sight (no, I still don’t like pink) to see. It was almost sureal and felt like watching a video. This was a great example of the “bonzai” effect in Japan, where in Japan they take natural forming wonders and expand them to these sureal areas. Almost like the Japanese gardens in Kyoto, but this was on a large scale on the whole moutain side. 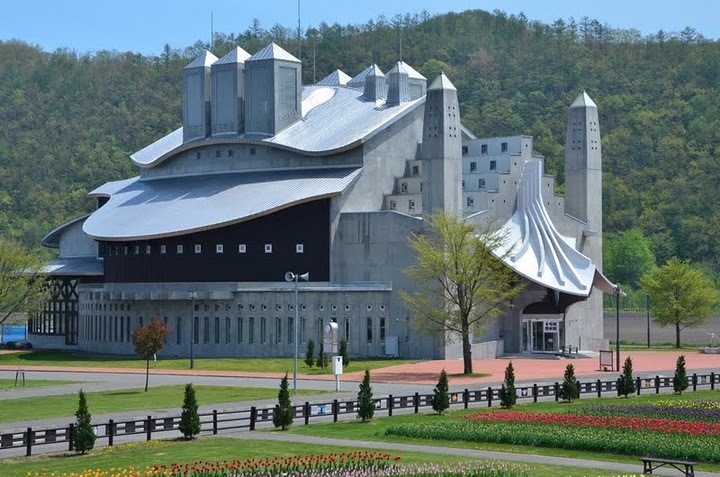 Something you should go see for yourself as the pictures don’t do it justice. Later that night we went to the onsen again, and after the bath we had dinner with the mayor and some officials from the village office. We talked more on a personal note and got to know the people a little bit more. A fun dinner and learned more about the local people and customs. The next day the newspaper article came out. As we were heading down to Engaru/Shirataki Village we were called by the Mayor of Engaru to meet with him. 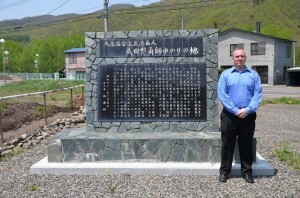 We went to Mr. Sasaki Shuichi and the Engaru village office and had a meeting/visit with him. This had the same tone of his curiosity in our trip to Hokaido and also his concern over the international view of Japan in the media. He expressed his concern that the world views all of Japan as not safe and we talked about some ideas we could do to help in our own ways. We thanked him for the visit and went on to visit Shirataki village which was Osensei’s home while he was in Hokaido..
We started by going to the Shirataki local museum. This had a lot on the farming and tools of the pioneers era. 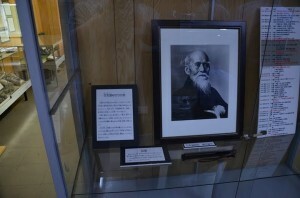 There was also a exhibit on Osensei and a little more on the details on his life here. 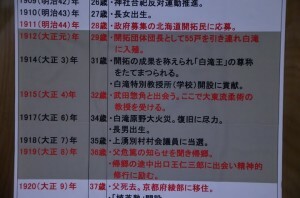 There was a cool timeline (in Japanese) that had his overall life, but highlighted his time in Hokaido. There was also Osensei’s metal war fan which was pretty interesting (looked heavy). After we stopped by a small monument to Takeda Sokaku and Daitoryu. 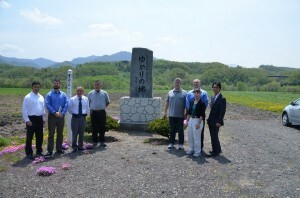 Next we went monument dedicated to Osensei and his time in the village. This was a beautiful and peacefull place out of town and in the middle of the mountains around us. Across the street from the monument we went to the Aiki Shrine (Shirataki Aiki Shrine). This was a way off the road into the trees. Inside it was very interesting. On one side had wooden notes for each person who donated to build the original shrine and how much they donated. On the other side it had notes who dontated to fix the shrine’s roof. We talked a little about this before and what we could do to help get the word out and a vehicle to get donations to fix the Aiki shrine in Iwama that was partially broken from the earthquake. 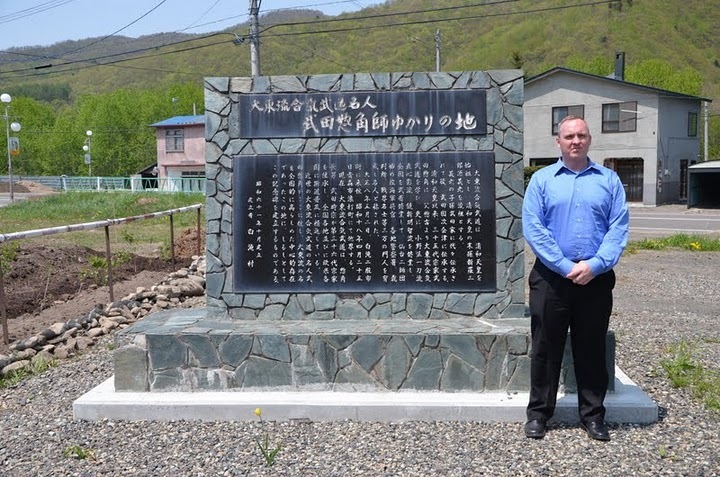 Maybe we can start small (like the Aiki shrine) to medium (spread the word to go to japan, and help boost people visiting again) and large (to slowly help Japan recover from the earthquake). Japan Kotowaza: Chirimo tsumoreba yama to naru “Even dust when accumulates can build a mountain”. 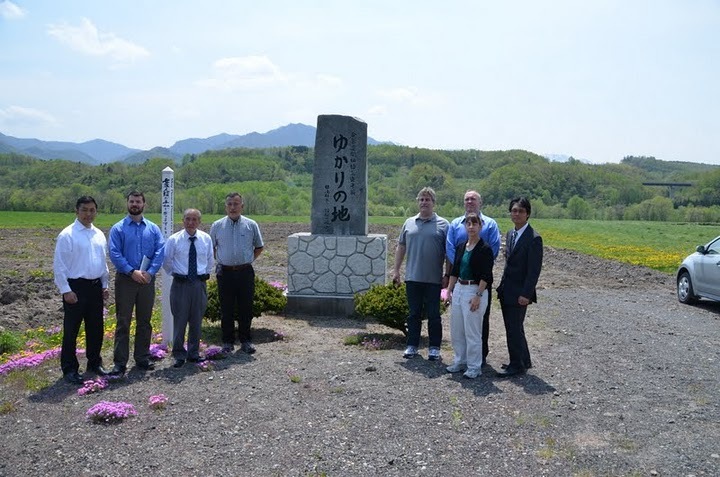 We then drove to a familiar mountain range that was the same range that was taken from the photo of Osensei in the same area (Looking for the original photo). Was nice as our hosts even gave us all a xerox of the picture for our reference). Lastly, we visited the waterfall which Shirataki name (white waterfall) was created from. We saw from a view from above and did not get a great view of it unfortunatelly. However, a very peacefull area. We went back to town and took a small rest and reflect on our morning. 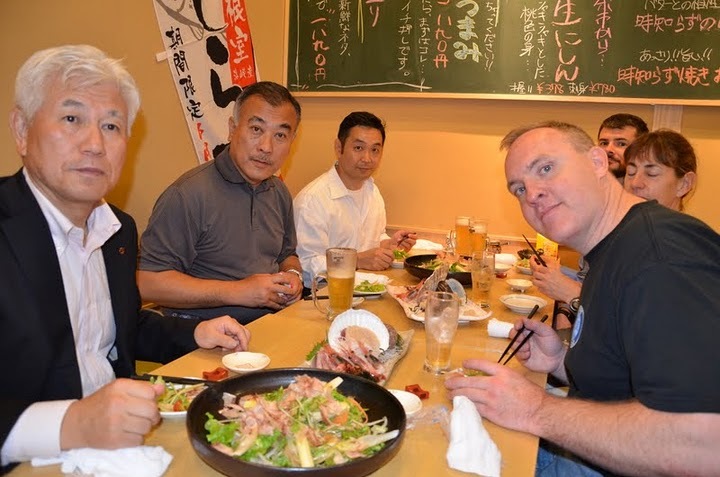 This was our last night and we had open practice that night in the local Yubetsu budokan. After class we went to the onsen, and then had dinner with our host. We talked about all the great things we had seen and one, and also a little about Aikido and exchange ideas for the future. The next morning we took the bus (bright and early 0700) from Yubetsu to Sapporo station (not bad for 4000 yen). This trip took 3-4 hours, but we had a great view of the mountains and the small villages in between. In Sapporo (as we got in around lunch) we stayed in the Susukino area. 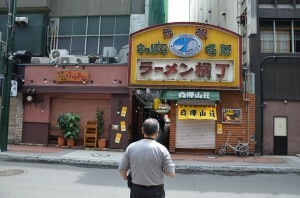 This was the area where we went to lunch in the famous Ramen street “Kouraku Ramen Meitengai”. This street has like 10 – 14 ramen stores all right next to each other, and at the entrance to the street was a little guide sign that described each restarant and some distiguishing features between the different shops (soup thickness, noodle thickness, etc). 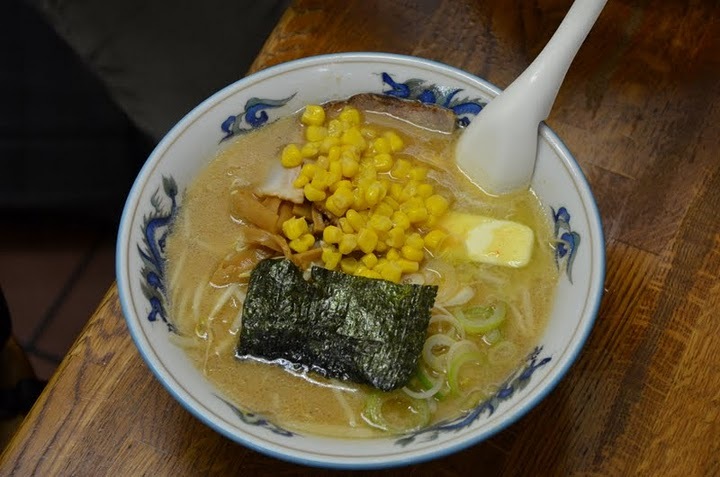 We choose our restaurant and I ate the heavenly Miso Butter Corn Ramen. Ummmm. Ummmm. Yes was that good. We went to practice in Sapporo that night with Fujii sensei. After practice we went to a local seafood/sushi restaurant. 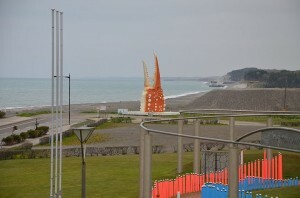 As we were so close to the ocean seafood and sushi is abundant in Hokaido. Also, compared to Tokyo the fish is a little fresher and not as expensive. We had a lot of different dishes and my favorite was the salt encrusted red snapper (Tai). 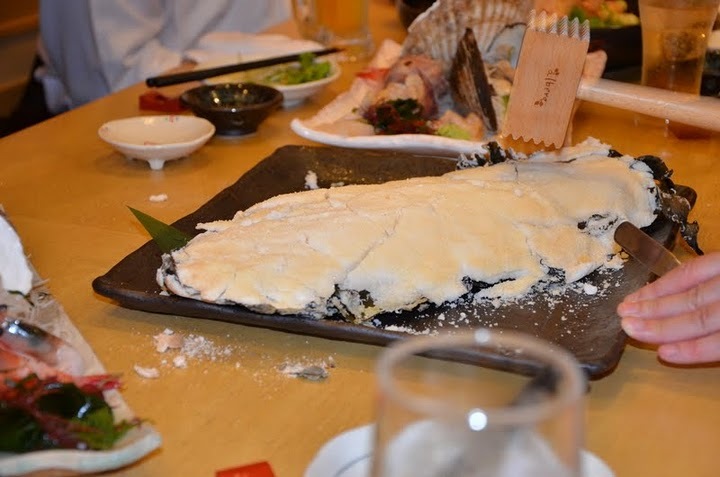 This was a snapper fish wrapped in seaweed (kombe? ), and a shell encrusted in salt. Wow, I almost want to eat more fish hehe. The next morning we flew back to Tokyo. Exhausted, but what a great few days. I definately want to go back to Hokaido again. It is a little out of the way but worth the trip. 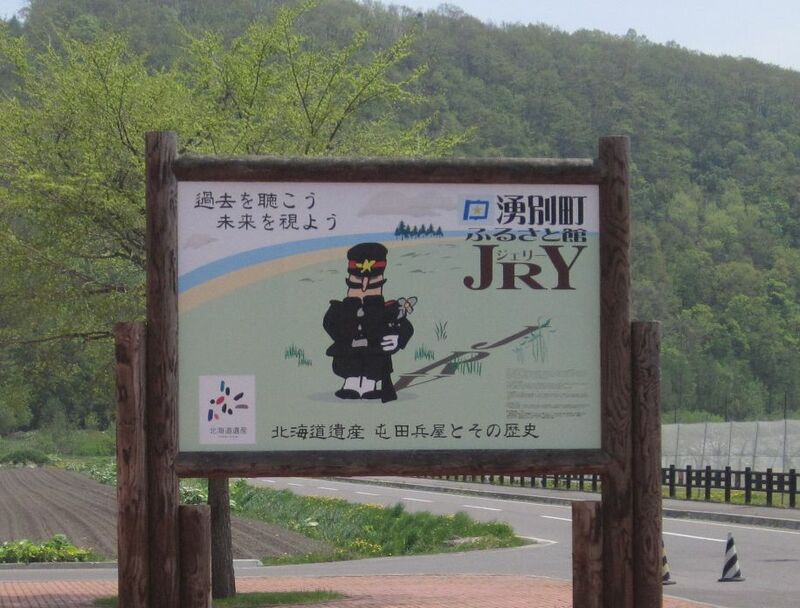 You get a little different flavor of Japan (small village, more modern in a way), but you will not be disappointed. My last note, on Aikido and Hokaido. Along with my other views of the hardships and how this process and experiences helped Osensei become who he was.I think Hokaido has another aspect that I found interesting. Most of the houses and buildings seemed to have more of a modern feel. Even the older houses (roofs, shapes, etc) did not have the same feel as maybe Kyoto has. 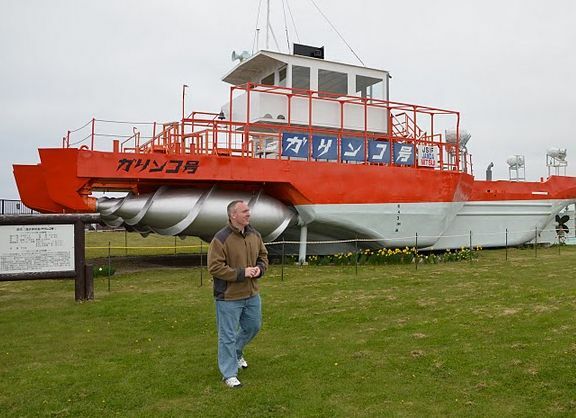 It was definitely Japan, but still different. I think in one small way this pioneering aspect had a “modern” influence on Aikido. Osensei took his training and experiences in the older styles of martial arts and created this “modern” or “do” version of his martial art. Like Hokaido I think Aikido also has a strong Japanese feel, but expresses itself in a more elegant way. Not good or bad, just is. 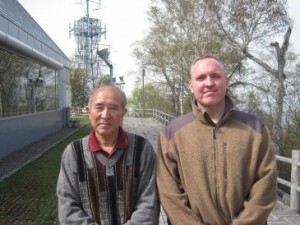 – Ozaki Sensei for hosting us and guiding us in Monbetsu, Yubetsu, and Engaru. 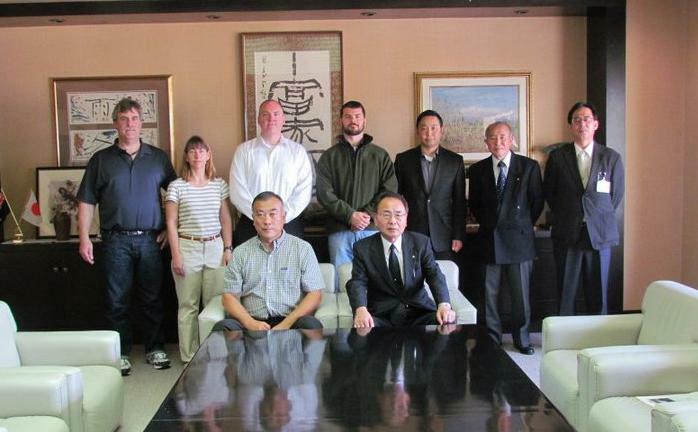 – Others: Yubetsu Mayor Mr. Masami Harada, Engaru Mayor Mr. Sasaki Shuichi, Mr. Shigemitsu Matsuda of the Yubetsu Board of Education, Mr. Masashi Kuboto (Ozaki sensei’s student). Thanks for sharing those pictures Christopher.